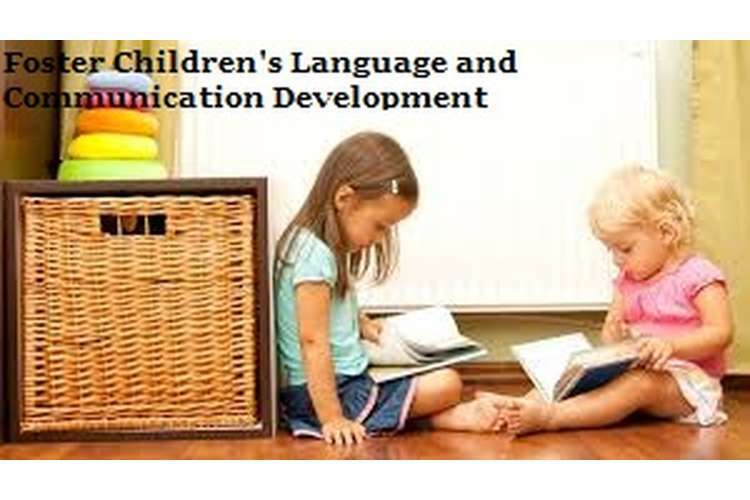 This is a solution of foster children's language and communication development assessment in which discuss learning and communication skills of 4 year old children and stimulate the child’s use and understanding of language. The activity which can be used for this purpose is the act of reading a story to the children in the class. This will be followed by a discussion between the students and the teacher, in which the teacher will ask the children to describe what they found interesting or best about the story. This will be followed by game in which one child will be asked to start the story told by the teacher. The teacher will stop the student after one line of story and will ask another student to continue from that point. This will be game which will keep the children interested in the story as well as enhance their speaking skills. This will dissipate the shyness among children and will promote active participation in class. The story used will be a children’s story, thus it will remain suitable for the children of age four. Moreover, the activity will not be made strenuous but in the form of a game. The second activity will be a group puzzle solving activity. The puzzles can be in the form of animal or block puzzles or puzzles which are relevant to the topics of the class. This again will be a game in which the whole strength of the class will be divided into groups of three and four and will be asked to complete the game. This will promote interaction and learning which can be changed on the focus of the topic of learning. This will be a fun activity and will drive healthy competition. The nature of the puzzles used will make sure that the activity remains enjoyable for children of age four. Moreover, the activity will help in creation of learning, communication, promotion of competition, and will drive motivation to apply. The last activity which will be used is based on class speaking. In this activity, the children will be asked to speak on their best friend from the class. This best friend will be the child, who is liked most, by the child who is speaking. The children will be asked to speak three line son their best friend. It will be the job of the teacher to keep the activity lively and fun. The children in this activity will speak out, thus improving their communication skills. They will also learn to speak out their thoughts in sentences. The topic of the activity will make sure that the activity is prevalent for 4 years old. The EYLF is focused on play based learning. The major characteristic of play based learning is the communication and interaction among children, and between the child and its parents or teachers. The base concept of EYLF is that it promotes group leaning in a semi-class room or group environment. In both these cases, a child will communicate, thus developing its language skills. Moreover, the focused learning plan of EYLF will help create effective activities which promote more use of speaking activity. The curriculum developed is such that, it focuses on language development, which helps in creation of activities which promotes language development (Fleet & Patterson, 2011). The best way to learn about a child’s interest is to ask questions which a child finds easier to answer. The questions asked should be in such a manner, that the person asking the questions is a perceived as a friend or a temporary guardian for the child. Moreover, the questions should focus on the activities which Rachel may like doing. The best way to start of the communication with Rachel is to ask about its friends in school or community. Rachel will find it easier and fun to answer this question. If the child is active in nature, then further information may flow easier from that point. If the child is silent in nature, then questions based on the activities of the friends, best friends, and best thing about the child’s best friend, etc. will help open up the child in such a manner, that an estimate for the activities of the child’s nature can be made. Furthermore questions can be asked based on this communication (Ostrosky, et al, n.d. ). What are you best friend’s name? Who are your friends in school/locality? What do you like playing in school with your friends? What is your favourite game in school/community? What do you like watching on TV/what is your favourite TV program? What are your favourite food/ second favourite food? What do you like doing best with your parents? The topic of the discussion was to set up an effective work schedule, for the next two days. The discussion was on the allocation of work to each and every person who was part of the team. The context of the discussion was that there was unexpectedly large in flow of work which had to be resolved in a time period of two days. Moreover, the work was urgent in nature. As a result effective work management was needed for it to be possible. The purpose of the discussion was to decide upon a schedule of work which can be met, so that the deadline can be met. The discussion was successful. The allocation of work was done on the basis of the person’s strength, past experience, and ability to do the work in a time and qualityefficient manner. The discussion took large amount of time, but it was concluded with effective results. The discussion involved a Project Lead, senior members of the team, and junior members of the team. Majority of the discussion was done between the project lead and senior members. Although Project lead and senior members participated in the discussion actively, the junior members participation percentage out of their total number was 50%. Appropriate time to each member to put in their opinion and make a note of it. Asking the junior members to speak freely was not able to achieve the desired results. Allocating work previous to the discussion to each member of the team, so that effective discussion can be made on the work allocated and how it can be improved. Asking the junior members to participate in the discussion, so as to make it effective. The chain story telling activity. The activity will take place among a group of children. The activity will start by a child making the first statement of a story. The next child will be asked to continue the story from that statement, and so on. The activity will help promote thought process and communication. It will bring out the correct use of language for the thoughts of the children. Thus, it will enhance the usage of language and will increase comfort level of the language (Ostrosky, et al, n.d.). The second activity will be a home work process in which the child will be given a picture book or a storybook. The child will be asked to make use of the help of its parents in reading the story book or the picture book. The parents under this activity will communicate with the child on the story, thus promoting the use of language. The child will be asked to retell the story in the book subscribed, to the group of children or in a classroom. This will enhance retention process, and will promote use of effective language skills. In the third activity, children will be asked to create a small story, between the groups of four children. The class will be divided into the groups of four children. Each group will be asked to tell their story to the class. The activity will be simplified by the teacher, who will help the students get different ideas for the story and will provide hints on the different stories. The children in this case will make use of the stories they have heard from their friends, parents, and teachers or have seen on TV. This will help usage of the ideas from the environment and will promote communication between children and the class. Who do you like best in your family father/mother/Grand Parents? Who do you like playing with in your play group/ who are your friends? The child will tell the story is short snippets, or the child will give an indication of the name of the story if he remembers. The child may give an exact answer or may describe the characters of the show to give an indication. There were times when my father used to repeatedly tell me about the importance of studying at a respectable distance from the book or the personal computer, in order to lessen and prevent strain on my eyes. I didn’t used to listen to him or give him attention; because I was either too engrossed in a book or on the computer or ignored it due to the irritation caused as a result of repeated reminders. The result was that, my father discontinued this practice and I started suffering from itching and water in my eyes. Moreover, I suffered from a symptom of red eyes due to extensive strain and had to wear precautionary eye glasses. I should have taken his advice into practice and thus it would have prevented me from getting a medical condition and it would have also stopped my father from reputedly reminding me as I would have been following his instructions. There was a time when I was in team discussion at work. I was a new employee and was considered junior employee in the team. I have been working on job since one year. I have proved my expertise in my area of work. There was a crisis during which team meeting was called and everyone was asked to provide their viewpoints. The discussion was open in nature. When I provided my opinion the body language of the manager was such that he ignored me completely. This made me feel frustrated and hurt my confidence level bya large amount. The overall feeling was of worthlessness and inability to prove myself. After this incident it took me approximately six months to actively speak again during the team discussion. What will you like to play? Do you want to eat something; this can be augmented by providing a toffee or a cookie? Why are you not speaking to me/I am your friend, please talk to me. Who are your best friend/ what is he doing? Come on play with me/ Why are you not playing with me? Are you feeling hungry/Do you want to eat something, for example a cookie? What do you want to play/Why are you not playing? Are you missing your parents/what do you like doing with your parents? Are you hurting somewhere or feeling sick in stomach or limbs? Why are you not talking to me/ you are my friend? Teacher 1: My favourite colour is red. What is your favourite colour? Teacher 2: My favourite colour is green. I like to play with dolls. What do you like to play with? Teacher 1: l like to play with blocks. My favourite cartoon is Tom & Jerry. Teacher 2: Mine too! Will you be my friend? Teacher 1: Yes, I will like to be your friend. Babies and infants communicate by expressing their emotions in the form of movement of their hands and legs, or even their body if their active. A child wanting something which may be attention from parent or bringing out the exclamation of pain, hunger, or some other form of discomfort by crying. The discomfort is communicated by crying while happiness and contentedness is communicated by movement of limbs, and body and smiling of the child. The child shows reaction in the form of wanting for a particular thing by pointing towards it or making a show of moving towards it. The communication can be made two-way by making an effort to understand the child, and reacting to the actions of the child. The child also makes sound in the form of wanting for something which may become pronounced in the form of some words which a child may have picked up. The communication can be made effective by making similar reactions as of child by pointing towards the direction which the child is indicating and making musical sound to gain the attention of the child (Ostrosky, et al, n.d.). The game which can be played with a child to expand his vocabulary is the game played by the use of a picture book and the use of a coloured blocks. The game will be played by showing the child two or three images and the child will be asked to make sentence by using those images. The sentence will be made by making use of coloured blocks. If the game is played in a group of three children, the best sentence can be provided a win. This way the children can be taught different vocabulary and how to make complete and effective sentences. The game can be played between a parent and a child or even in a group setting. The use of coloured pictures and coloured blocks will keep it effective and fun for the child. The advice which can be given to the mother of the child will be creating a balance between the child’s native language and the child’s use of English. Excessive concentration on one will hinder the growth of other. The usage of English will be promoted by the use of English in class environment and the use of English in the current locality of the child as the child is now living in an English speaking community. Thus, the effect of English being taught, spoken, and used in daily life will enable the child to learn English in an effective manner. The suggested way of going about this will be that one of the child’s parents communicates in Italian while the other parent communicates in English. This part can be divided on the basis of the mastery of the respective languages. Moreover, if the child’s mother is a single parent then she can divide her time into the use of languages, i.e. morning to afternoon communication in Italian and evening communication in English. If possible, before the actual meeting, a person should read up on other culture so as to not make crucial mistakes, which may insult the other person. If the other person greets you is a manner, which is different to your culture, it will be appreciated if you reciprocate it. Learning small phrases with simple usage, in spite of the chance of having a faulty pronunciation shows appreciation and effort to understand the other culture. Keeping an open mind at all times, as what may be something for you, may be something different for the other person. If other person greets you in one manner, do not ignore it. If other person doesn’t understand your culture, do not try to force it on him. The name of the book is Stories from Spain / Historias de España. It is a book which has stories written side by side in the Spanish and English languages. The book contains multiple stories which are related to the history of Spain. It contains folklore and famous historical stories related to Spain. The book can be used to teach Spanish to English children. Moreover, the stories are based on Historical stories of Spain which can be used to create interest in folklore or to familiarise the children with common Spanish statements and words. The major advantage of using such a book is that it eliminates the back draw of referencing two books for learning a new language. The growth in the learning of both languages can be promoted simultaneously. Moreover, it can be used to learn a foreign language in a much more effective manner. It makes the learning less time consuming and much more efficient. The book is of high quality because it has been written for Spanishhistorystories. Moreover, the book has its corresponding language in the next page, which makes reading quite easy. Moreover, it reduces the time taken by the teacher to point a particular fact. The cultural experience which can be used as an opportunity to develop children’s language and communication skills is that the teacher can identify the cultural backgrounds of the children. Further the teacher can incorporate practices like using traditional tools to eat and drink, for example the teacher can ask students to use chopsticks to eat fried rice or noodles which would dive an opportunity to the Asian students to teach their peers about using the tool. This would help the students of different cultural backgrounds to interact among themselves. Similarly the teacher can incorporate posters, food, music, dance and story-telling to let the students get exposed to different cultures. This would increase the child’s knowledge about different cultures and they would get to interact with people from different cultural backgrounds (Hogan, 2012). When there is a culturally diverse crowd then it is very important to present the children with appropriate knowledge and resources which would bring out the uniqueness of their cultural backgrounds. This would foster in children to learn about different cultural backgrounds. There are certain ways in which the children can be encouraged to learn from different cultures like the children can communicate through sign language while telling a story which would help to communicate with children of different cultural backgrounds and promote an atmosphere of inclusion and open mindedness. In early childhood, the teacher can introduce common greeting words, numbers and songs in languages other than English which would help the child to have an exposure of other languages as well. The reason behind children having difficulty towards learning to speak can be due to slower muscular movements, slower understanding of the adult language and due to excess of school language as compare to communicative language. Some children might find it real difficult to make fast muscular movements that would hamper the speed at which they talk and hence they would find it difficult to interact at a rapid pace. The thoughts might be flowing but the child might find it difficult to express them verbally and hence the child might find it difficult to speak. Another reason is that the child might not be adept in understanding the language which adults use. They might listen to the words but not be able to comprehend the same at the same pace at which it is spoken. Hence the child ends up not understanding what has been communicated. Hence the child ends up speaking nothing in return of what has been asked. Therefore it is very important for the adults to be at the same pace as the child so that they can make each other understand which helps in further communication. Other reason is that the children learn only the text books language which is not enough to carry out a proper conversation and hence the child finds it difficult to learn to speak properly. The schools should take up the initiative to have oral and aural classes which would help the child build their cognitive power and to learn to speak after comprehending what has been taught to them (Deponio & Macintyre, 2013). The benefits of working collaboratively are that it helps forming consensus and strengthens partnership activities. It helps in demolishing any kind of boundary that exists and helps in having a panoramic approach towards problems. Working collaboratively is beneficial for team building. Working collaboratively also helps dividing the efforts among individuals. The work done is more and the effort on individual basis is less. Collaboration helps in building mutual support, helps in exchanging ideas among the groups and helps in sharing the individual expertise. The parties involved have high levels of trust among themselves. Collaboration helps in building broader perspectives about any issues which might arise from time to time. The Aboriginal English is different from Standard English in many ways. Major differences being that many prepositions are left out in aboriginal English. In aboriginal English there is not third person, it replace s “what” with “that”, the number system is non-consistent, past tense is doubly marked, the sentence structure is long and loosely connected, there is absence of clausal marks, it does not use questions to get information and questioning if any is always indirect. Hence the major difference between aboriginal English and Standard English is in the form of words, sounds, grammar, lexical, discourse and pragmatics. Therefore aboriginal English is a mix of English and aboriginal languages. It is majorly used by the aboriginal communities. It differs from English in all ways linguistically. Many words used in aboriginal English have entirely different meaning in English language (Usborne et al, 2012). The student would be able to read story books with the patterns of the words. The child would be able to recognize the upper case and lower case separately. The child would be able to use illustrations to tell a story. The targeted leaning outcome of the mentioned IEP would be that the teacher would help the child to identify the pattern of the words and later the child would be able to do that on his own. The teacher would also help the child to use the lower and upper case of words where it is required which would help the child to know the proper nouns and verbs and to use them appropriately while writing any article. The outcome of the IEP which mentions that the child would be able to use illustrations while narrating a story would be made possible when teacher makes the child understand the pictorial representations of the elements of the story. With the successful completion of the mentioned IEP’s the child would be able to recognise patterns of words, he would be able to identify the difference between the upper and the lower case and would also be able to narrate a story through signs and pictures. IEP sets a goal for individual student and also the instructor which helps them to achieve the particular objective in a stipulated time. This would help the student as well as the instructor to keep a check on the performance and would also give them a benchmark to be achieved in a said time frame (Council, 2012). The job advertisement would be as follows. Monitoring the progress which the client makes. Should be able to cope with the waiting queues and priority clients. Should be able to maintain data of each client and should also be able to keep confidential information about the clients. At organisation level the speech therapist should be able to set organisational as well as personal objectives, should be able to plan training sessions, carry out personal development classes for the colleagues and should participate in research projects. Gathering information: reviewing of Maggie’s records and previous IEP’s, having a session with her parents and teachers, evaluating the current work done by Maggie lately and collate the information gathered (Council, 2012). What improvements has Maggie made while expressing herself in last three months? What is the baseline of the whole activity? What is Maggie able to do now as compared to her earlier stage? What is the present level of improvement in Maggie? Is Maggie able to complete the task all by herself? What tools would help Maggie to increase her current level of expressing herself? Going forward what kinds of cognitive and meta-cognitive strategies should be used to take Maggie’s performance to next level. Four year old child who falls within the range of typical learning development should be able to recognise similar sounding words, read alphabet books, understand the concept of “tallest”, “biggest” etc., they are very good story tellers, like word plays, understand the sequence of routine work, are able to remember six to seven names of object around them and are able to use past tense words appropriately. They would be able to learn new words easily. It helps the cognitive development of the child’s brain. The language gives the child a sense of identity. Anyone who speaks more than one language always has an upper edge in the globalized world (Byrd, 2012). The child’s peers should help the child by telling him that there is no pressure on him to mingle with the crowd but the child should try slowly to get warm with the people with whom his temperament matches. The crowd might be overwhelming but if the child has faith that his peers will not leave him alone on his own, he would always feel comfortable. Child’s peer should help him meet new people and to imbibe the good qualities from them. Lifelong learning refers to the on-going process of learning for either professional or personal growth. This means that learning is not the process which one should follow during the childhood instead it is a life-long process which enable individuals to get to know new things every minute. Knowledge is never enough and so is the learning process. Each day there is some thing or the other which teaches a lot to individuals (Longworth, 2013). Social constructivist theory is a sociological theory of learning. In this the individuals engage in groups to share their knowledge. Knowledge is never enough for any of the individuals. In this there is a collective group in which the people share knowledge and enhance their level of knowledge by sharing their experiences. In such groups, there is learning all the time. The major attraction of the group is the strength of learning at all times (Zimmerman & Schunk, 2013). While selecting story books for young children the illustrations should be colourful, text should be clear, books with the child’s favourite character, “do it yourself” books, books with chapters which the child would be able to read over a period of time rather than one sitting. For older children the story books should be about the subjects that interests the child, novels would be advisable as it would help the child to manage with the challenges of growing up, books with new experiences and opportunities, biographies and folk tales would also be pertinent for the older children. Children are sensitive to pictures. Children use the pictorial code as a stimulus for further communication. When children look at the pictures in the book, they are able to make a story on their own with the series of pictures in the book. This also helps in building the child’s imagination. Pictures are a kind of language for the children as they have a stronger impact on the cognitive powers of the child. Sometimes picture help the child to communicate easily by comprehending what the picture tells in his own words (Resing et al, 2012). Puppets are often used in the process of storytelling. This helps to build the child’s interest as a result of which the children actively participate in the storytelling process. While children are enjoying the puppets, they are also able to develop their listening skills by comprehending what actually the puppet is expressing. The puppets make it easy for the story to get characterized. Puppets also help the children to vent out their emotions (Resing et al, 2012). The booklet is launched with the prime idea to assist parents on working towards the development of language and communication of their children at an ease. Communication is the only method by which the children express their intentions and interests to the parents. The language can be developed provided the parents offer the right space to involve and educate the children on Standard English. Different sections of this booklet would drive the parents and children on different developmental aspects in the real life. Parents need to establish strong rapport with the children so that the children have the comfort to express anything and everything to their parents. Suppose that the child is feeling uncomfortable, the communication is totally curtailed. As a result, the language development is hindered. This booklet insists that the collaboration of parents and children is essential to attain the necessary benefits on the communication development. How to support children’s communication? The first method to support children’s language and communication development is to create a space of openness. At this stage, the children will experience a high degree of freedom (Hanen, n.d.). It is an opportunity and not the duty of the parents to enable their child to learn the skills and advance it in due course of time. The strong bonding will itself empower the language understanding of the children. The next method is to encourage the child to interact with the society (Ostrosky et al, n.d.). This is yet another method where the children can express their feelings with the friends. Moreover, the communication development happens at this space with better outputs. The children can easily connect with others and gain motivation in their aim to develop their understanding of language as well as communication with the society. It is not a problem if the first language of the child is not English. In order to become proficient in Standard English, all that is needed is a quality environment. This environment has the ability to influence the child in terms of communication as well as behavioural growth. The parents have to assist children to remain exposed to supportive environments where they will develop their language as well as establish positive relationships. The wants and the needs of the children can be expressed only with the close ones. Hence, it is the duty of the parents to create the right opportunities for the children to learn the language (Ostrosky et al, n.d.). In addition to it, the parents can organize sessions within the home to enhance the language development. This will provide so many advantages. Additionally, the children should be trained on the nature of society. This will let the children to manage different environments and learn the standard form of English at an ease. It is also recommended for the parents to engage the children in play schools. At this environment, the child can enjoy maximum freedom and support by associating with children of their ages. In addition to language development, the child will also have the intention to improve their communication further. This booklet has covered a wide range of opportunities and the importance of parents to support the growth of their children in terms of communication development. Fruitful results can be obtained as long as the parents are aware and seriously interested to promote and support their children irrespective of the actual first language that they follow. The booklet has covered the other factors that would influence the children to develop the standard form of English and use it for communication purposes. According to the Vygotsky’s theory of child development, the child’s cognitive and socialdevelopment can be divided into the stages of infancy, early childhood, pre-school age, school age, and puberty. These stages of development undergo transitionfrom one stage to another at theages of 1, 3,7,13 and 17 years of age. The Vygotsky’s theory of child development places major importance to the society in which a child is brought up in. According to him thechild’s cognitivedevelopment grows in line with the learningexperience which surrounds him and demands from him. The learning experience of a jungle dweller and the learning experience of a child in Melbourne will be differentand will define their cognitive development (Vygotsky, 1978). The Paiget’s theory of cognitive development lays down four different stages of cognitive development. This theory in contrast to Vygotsky is universal in nature, irrespective of environment, social needs, etc. Each stage of learning is divided into sub-stages, which vary from stage to stage. The theory hasdifferent substages that track child’s cognitive development starting from the age of six weeks. This theory is based on child’s cognitivedevelopment and it focuses on the biology of the development of the child. In contest Vygotsky’s theory is sociological in nature and gives little focus to child’s early development. Moreover, Paiget’s theory is detailed and well researched in nature (Ginsburg & Opper, 1988). The Gardner’s theory of multiple intelligences is the one where in Gardner proposes that the mind is divided into separate sections with each section focusing on development of different activities. Thus, there is little relationship between an individual being strong in one filed being compared to the person being strong in another filed. According to him each person has a different focused sensory system which allows him to take in information in different ways (Brualdi, 1996). The Preoperational stage is the one where in the child’s learning and development of language occurs. The end of Sensorimotor stage marks the start of the language development. It becomes developed and expands during the pre-operational stage (Ginsburg & Opper, 1988). It acts as transmission medium for the learning process. It is used by parents andteachers to communicatelearning and knowledge to the child. Thus, in essence language is used to transmit language in the earlier stages. The language develops into learning tool which helps inculcation of other learningprocess. Thus, essentially the role of the language in both the cases is of a tool which makes it easier to adapt in an environment (Vygotsky, 1978). The languagelearning process starts when the child’sstartsinteracting socially i.e. with its parents, teachers, friends, etc. Gardner’s theory points out that it is not the fault of the child, neither is the child weak in particular field if he is not being able to learn in a particular way. It points out that there are always better ways and methods to teach a child. Moreover, what may be applicable to one may not be applicable to another. Thus, the teachers need to modify and change their teaching patterns so as to deliver information effectively. This will result in much better learning process in children (Brualdi, 1996). Deponio, P., & Macintyre, C. (2013). Identifying and Supporting Children with Specific Learning Difficulties: Looking Beyond the Label to Support the Whole Child. Routledge. Usborne, E., Peck, J., Smith, D. L., & Taylor, D. M. (2012). Learning through an Aboriginal language: The impact on students’ English and Aboriginal language skills. Canadian Journal of Education/Revue canadienne de l'éducation, 34(4), 200-215. Council, C. (2012). Flowchart for creating an IEP. Byrd, D. (2012). Cognitive Benefits of Being Bilingual. Journal of the Washington Academy of Sciences, 98(3), 19.